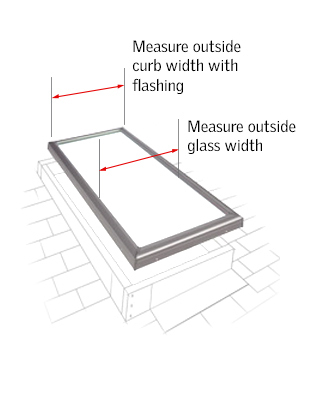 How to measure for a skylight replacement. So, you've decided to replace the skylights on your reroofing jobs. Congratulations on earning extra money per job and leaving your customers with a product that will keep them smiling for years. Now you need to measure for the replacement. 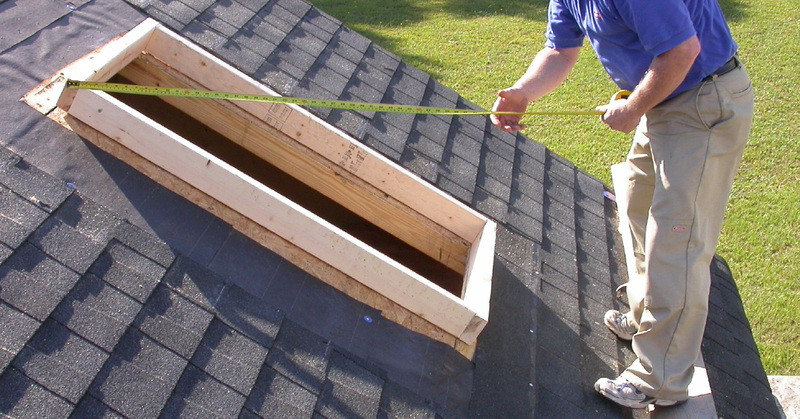 How and what you measure will be determined by what kind of skylight is already on the roof. 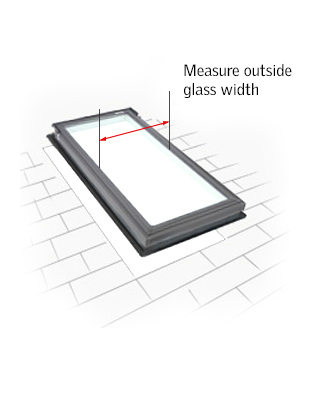 In this article, we explain how to measure for replacing old VELUX deck-mounted skylights, any kind of curb-mounted skylights and non-VELUX deck-mounted skylights. Once you have your measurements, call VELUX customer service at (888) 242-7081 for assistance in selecting the optimal size skylight for your replacement job. Deck-Mounted VELUX Skylights — Look on the inside frame. Curb-Mounted VELUX Skylights — Find it stamped on one of the four exterior sides. VELUX Roof Windows — Look inside the ventilation flap. If you can't find an ID tag, look for the VELTERM number printed on the spacer bar separating the glass panes. Even with the product ID tag information, it's still important to measure the old VELUX skylight to ensure you order the replacement size that fits best. For deck-mounted models, measure the exterior glass pane length and width from the inside edge of the cladding. Call VELUX customer service at (888) 242-7081 with your measurements for assistance in selecting the optimal size skylight for your replacement job. The newest VELUX models have a slightly different drywall groove, so the drywall panel at the top of the skylight may need to be trimmed down for the new skylight to fit. If there's a gap between the drywall and the skylight, use door casing molding or crown molding to cover it. For small gaps, use painter's caulk to fill in the gap. The outside glass length and width from the inside edge of the skylight cladding. 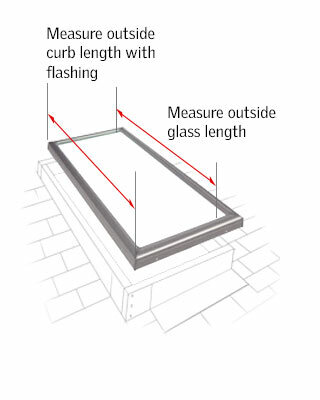 Watch this short video that shows how to measure curb-mounted skylights. 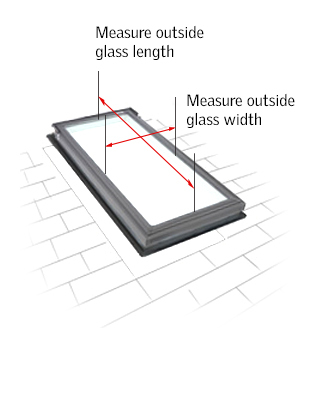 Contact VELUX customer service with your measurements for assistance in selecting the new skylight. 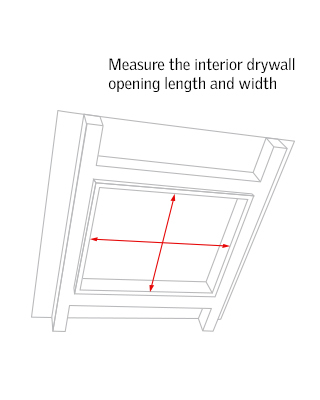 For non-VELUX skylights, measure the drywall opening length and width on the inside of the house, the length and width of the exterior glass inside the cladding and the overall size of the skylight (inclusive of cladding). 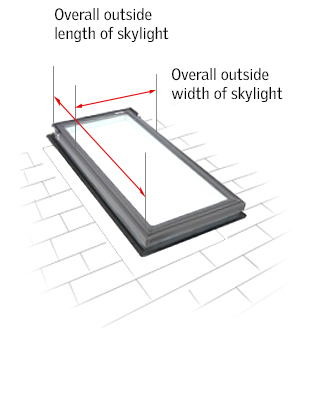 The best option is to call VELUX customer service, where our experts can help you select the optimal skylight size based on your measurements. Make sure you protect the newly installed roof and skylight by installing new VELUX flashing on the new skylight. Doing so will ensure that your customer is covered by the VELUX 10-year No Leak warranty on product and installation.